Montreal is a stunning Canadian city, located in the French province of Quebec. The beauty of Montreal lies in its cobblestone streets, old port and the beautiful French remnants. Old Montreal is the oldest part of the city. It has a historical square which is surround by the famous basilica, the old port and stunning colorful lanes. Use this one day in Montreal Itinerary and travel guide to plan your day. We have captured the best of the city’s old town charm, the downtown area, shops and more, so that you can the best of Montreal in a day. Beautiful Heritage. Just beautiful heritage, so French and so elegant. Where to stay in Montreal Canada? We arrived in Montreal via airways (Air Canada) in the early hours, at about 07:00 am. We decided to a cab ride to Old Montreal to start exploring the city. The cab fare costs us $30 CAD and we reached Notre Dame Basilica in 20 minutes. There is metro service available to the Basilica from the airport as well. Notre Dame Basilica is one of the National Historic Sites of Canada. The Basilica is dedicated to Mother Mary. The Basilica’s Gothic architecture is one of the splendid sights in the world. The structure is constructed of stone and the interior is decorated with golden stars and deep blue colored ceilings. It is filled with hundreds of intricate wooden carvings and religious statues. The Old Port of Montreal (French: Vieux-Port de Montréal) is the historic port of Montreal, Canada. It stretches for over two kilometres along the St-Lawrence River in Old Montreal. French fur traders have used this port as a trading post as early as 1611. In 2005, the Old Port of Montreal changed its name to The Quays of the Old Port of Montreal. 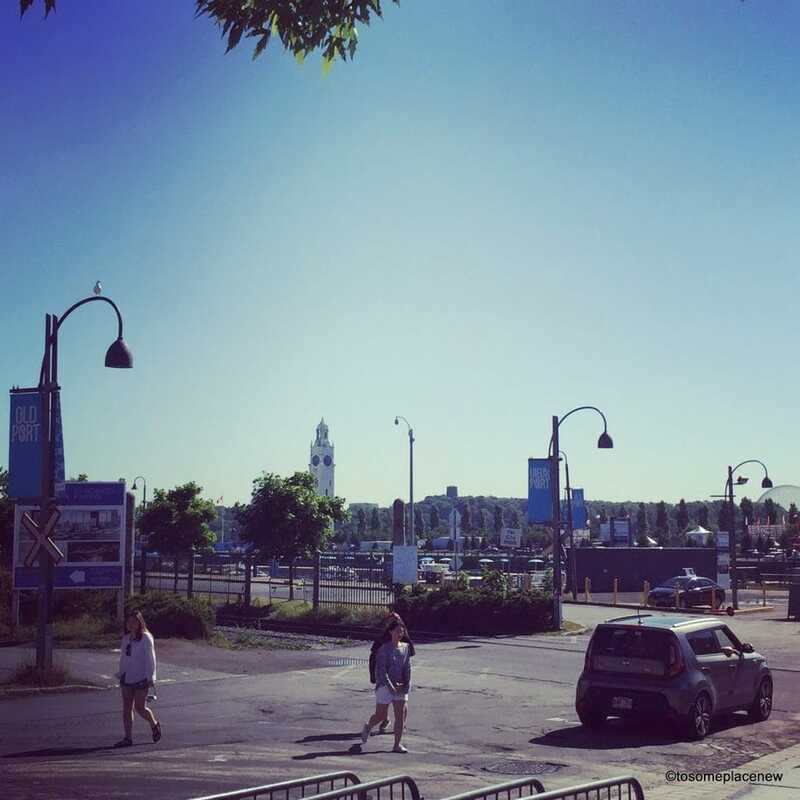 Currently, Old Port Montreal or Vieux Port de Montreal attracts millions of visitors each year. Activities like water adventures, spa, shopping, walking tours, boating, photo-shoot are common in the Old Port area. I loved walking in these areas ~ old French architecture, stories of by-gone days and beauty all around. This picture below was taken from Old Port. Its called the Notre-Dame-de-Bon-Secours Chapel (Our Lady of Good Help). It is one of the oldest churches in Montreal, built in 1771 over the ruins of an earlier chapel. For years, Saint-Paul Street was Montréal’s main street. Its a beautiful street with many 19th century warehouses recently renovated to serve as boutiques, artists’ studios, homes. The street is lined with flags and French art and architectural buildings. The street is paved with cobblestone all along. Just like any other major Canadian city, downtown Montreal had high rise buildings, manicured lanes, shopping centers, some churches and some monuments. Shopping complex, Complexe Desjardins, is located in Downtown Montreal. This picture is of the shopping mall from inside the building. The day we visited Montreal, Jazz festival – Rio Tinto was going on. We had an amazing lunch – beer and poutine at Rotisserie St-Hubert. Its located near Complexe Desjardins. Quebec City – One of the oldest European settlements in Canada, is the capital of Quebec – Quebec City. Everything here looks and feels European. It is an ideal day trip from Montreal as it is located only an hour away and is filled with history and the legislative buildings. Ottawa – Located very close to Montreal is also the capital city of Canada – Ottawa. You can easily explore the capital city’s highlights in a day and then return back to Montreal by evening. There are tours and trains, buses to take you to Ottawa from Montreal. Some of the key sightseeing spots include the Parliament hill, Rideau Canal, etc. Mont Tremblant – And into the mountains we go – Mont Tremblant is perfect for a quick day trip outside the city and into the lap of nature. It takes 1.50 hour to reach Mont Tremblant, one way. You can hike or enjoy the day at a mountain resort. During winters, ski and snow activities are very common here. The Laurentians – The Laurentians will transport you to the Swiss Alps in the blink of an eye. Stunning mountain ranges, resort town vibes and tons of outdoor activities to keep you busy for a day trip, head to the Laurentians. Eastern Townships – Located only about 2 hours away from Montreal, is the land of Eastern Townships. Almost in a world of its own, with beautiful buildings (and architecture), greenery and activities, Eastern Townships is an off beat day trip option from Montreal. You can go golfing, wine tasting, food tours, slow travel, and relaxation. Montreal is very well connected to all the major cities of the world. The city is served by the Pierre Elliott Trudeau International Airport, which is very well-connected to all the major destinations. Air Canada headquarters are in Montreal. Montreal is easily accessible via road and railways. It is very affordable and convenient to travel to Montreal from other major cities of Canada like Toronto (5.50 hours) or Ottawa (2.50 hours) or Quebec city (2.75 hours) or even from the United States. Travelers with a US/EU passport are eligible to come to Canada, without a tourist visa. They are, however, required to get a travel authorization prior to landing or arriving in Canada. Travel authorization or the eTA, as it’s called, can be applied online. It takes only a few minutes and you will receive the document via email. Please apply for the travel authorization before arriving in Canada. For visitors requiring a tourist visa, you will have to apply for a visa before arriving in Canada (not a visa on arrival). It is usually applied in your country of residence, with proof of funds and travel plans (or itinerary, hotel reservations to be shown) submitted with your application. Processing times vary by country. Tourist visa applications and travelers to Canada must have travel medical insurance. Canadian Dollars (CAD) are the mode of exchange in Montreal, Canada. Credit cards are widely used as well. Debit or ABM machines can be easily found in the city to withdraw cash. Canada is a bilingual nation and this is quite prominent in the province of Quebec. Most street or road signs will be in French. This is true for café and restaurant menus as well. So it will be nice to brush up on some French terms. We didn’t face any difficulty in navigating the city, without French language, as most people were able to help us with broken English. We recommend using HotelsCombined.com to find accommodation. It is our favorite hotels website for quickly comparing the prices of multiple hotel booking sites at once. Disclaimer : This post contains affiliate links. If you click one of them, I may receive a small commission (for which I am very grateful for) at no extra cost to you. I love visiting Old Montreal. I always feel like I am strolling the streets somewhere in Europe. Did you go into the Notre Dame Basilica? Isn’t it so gorgeous! Yes, we did. It was so serene and beautiful. We actually spent hours in the Place d Arms Square and the Old Port – wandering around. I can’t believe I’m a Canadian and I’ve never been to Montreal! When I go I will definitely be stopping by these spots, especially downtown Montreal! Montreal is a great domestic destination. I hope you get to visit very soon! I’m really skeptical when I see articles titled as “One-day guide” but this one was really great and you did a great job describing the city in just one day! This is a great itinerary for one day in Montreal. You’ve given me some great ideas for if I ever visit there! Thank you! Haven’t been to Montreal in a while but I loved it there! I wish I was old enough to appreciate some of the finer things about the city. I definitely will be going back someday!